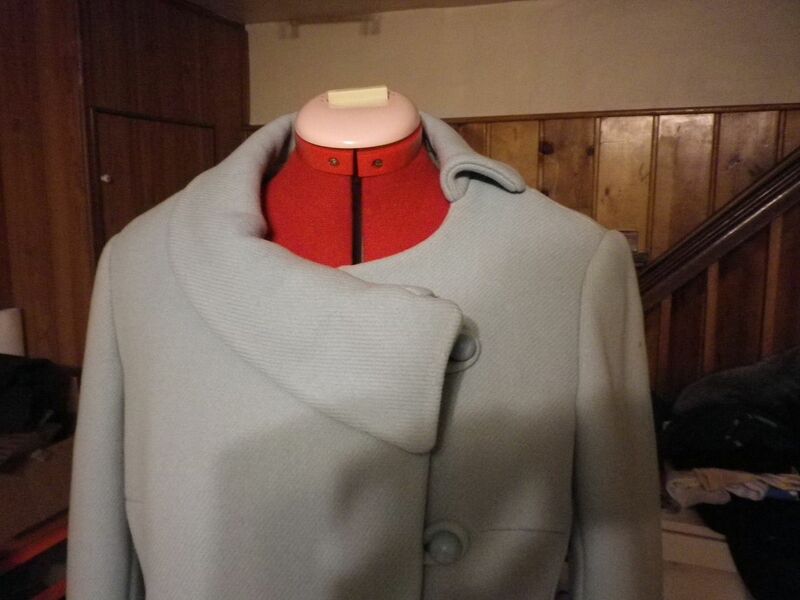 Remember my pastel blue vintage coat? It was just grime and dingy. Almost greasy feeling. I contacted a local theater and asked for suggestions on cleaners. I also asked if they knew someplace I could possibly dye the coat. The lead costumer warned me against dying. He said wool was temperamental and easily shrinks. Plus, any stains on the coat (of which there were a few) would pick up the dye even darker. So, he referred me to a dry cleaner less than a mile from my house that two theater companies in town work with. For $16, my coat looks pretty good! It still not brand new clean. But, for a 30 year old coat, it looks pretty awesome. I need to get the collar and cuffs sewn back on by Tuesday. I’d like to wear it for the inauguration ceremony. I have another coat in mind for the gala that night. No, no, don’t dye it. Apart from fabric behavior considerations, I think part of the charm is the vintagey color. It is so very cute. nice! perfect for the inauguration. Now, that worked out well. Love the style for you!!! Hey – that coat looks really good. Well, that worked out very well, it’s a darling style for you! Sure, I could possibly do that. Looks great…even wothout the fur collar and cuffs. You might be able to wear it in the spring sans fur..or is the coat a heavy one? The color is pretty…you needn’t dye it. It’s really really heavy. Thick wool, fully interfaced with interlining on the heavy lining. It does look like a different coat without the fur! that’s wIthout the collar and cuffs, not wOthout! That’s a great way to find a good drycleaner. The coat looks great. Color is breathtaking on you. Don’t change a thing. It is a truly beautiful coat. Love the fur accessories. Did the cleaners do the fur trim for you, too? Curious if you tried that bag-of-special-dust-from-the-hardware-store solution that some folks had mentioned. I can’t remember what the stuff was called! That intrigued me, though. Yes, I did. It was amazing! The stuff is d/earth https://missceliespants.com/2011/11/09/cleaning-the-fur-collar-and-cuffs/ is the post. Here in the hinterlands we don’t get many treasures like this jewel, so my feelings about these things are a little warped. I think that the little stains are like the patina on fine heirloom silver handed down from generation to generation. You can’t buy this stuff new – well, you could have it made, but even the fabric wouldn’t be as good. So treasure those few little “iffy” spots and just go on. Not many folks will even notice. It’s looks beautiful!